St Michael and All Angels Church in the village of Barton-le-Street, is situated about five miles west of Malton, between Appleton-le-Street and Slingsby. The church is an exquisite building, the Architectural historian Nicholas Pevsner referred to it as 'a sumptuous small Norman church, rebuilt without any restraint'. 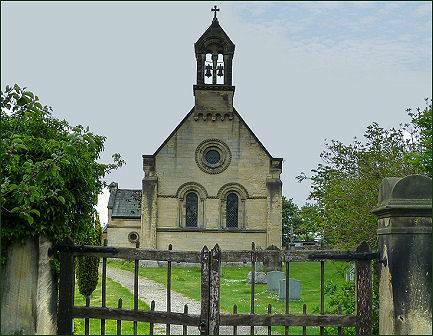 The original church was built around 1170, but was rebuilt from 1871 and incorporates elements of the original Norman church. The Porch and main entrance are particularly noteworthy. Immediately above the doorway are striking figures of the seasons, one kneeling to plant, one with a mattock, one with a sling to protect the growing crop, one with a sheaf of corn. Flanking these are depicted the Blessed Virgin Mary, with angels swinging censers round her, and shepherds and wise-men coming to adore the infant Jesus. 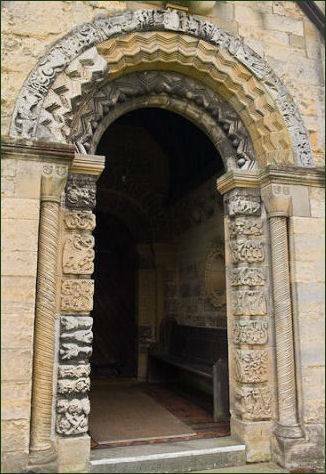 The north doorway displays an amazing collection of carving. Spiral pillars frame the door which has carved door jambs with blocks of foliage, birds, cats, dragons, angels playing instruments and mythical figures. Many of these carvings are original,others have been copied. 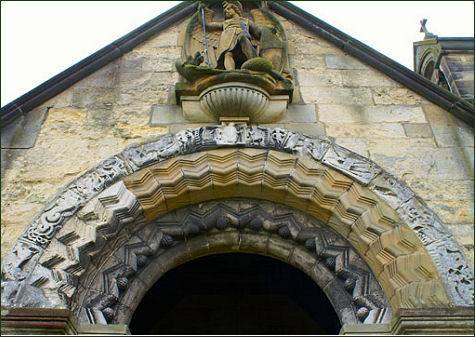 Above the doorway is a Victorian carving of St Michael killing the devil, represented by a dragon. To the right of the altar is an old piscina supported by an elaborately carved small pillar. The font dates to the nineteenth century, but is constructed in an elaborate Norman style. A memorial to Hugo Francis Meynell-Ingram commemorates the benefactor who paid for the rebuilding. 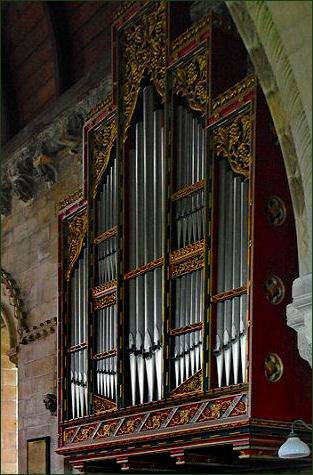 The splendid, colourful organ case by the Yorkshire architect Temple Moore is a lone Gothic detail in this homage to the Romanesque style, it probably came from Temple Newsham private chapel which was owned by the Meynall Ingram family who owned the manor and land of Barton.